@anmol @yunohost there's already a pleroma package (not official) for yunohost. Can you show your me ? The package looks good and well updated. It has the media cache support too. If this package passes the CI then it should be mirrored to yunohost-apps github repos page. @anmol @marsxyz @brunpi Yup that's the one. It's not really finished tho. I'm happy with the install scripts now (untill recently it wasn't possible to install multiple instances since it used default names for a whole bunch of things). The remove works, but needs extra work. backup and restore _kinda_ works but you have to remove the app before restoring works and I don't thinks that's supposed to be the case+I don't think you'll be able to fully restore to a fresh ynh install. And the upgrade is very naive atm. I've never done anything like this before (I've never even set up a webapp before ^^' ) which is why it's taking me so long. Feel free to clone or MR or copy or whatever tho. It's AGPL and so is yours I see. I have done some update. The app should work as multi-instance. The install,remove,update,backup restore work. I have taken option for open registration from your repo. But I don&apos;t understand how cache works in your repo. For me it gives error when nginx restarts. I have not take scope option from your repo. Is scope important option? @anmol Setting scope to true allows _direct_, _followers only, __unlisted_, _public_ messages be sent from Pleroma-FE. It also allows you to use subjects in your posts. By default this is set to false, which means people can't do it from the Pleroma-FE. Personally I set it to true (but left it as an option in the package). The reason why it's set to false by default is to be compatible with the GNU-social backend, but that's not an issue in this case, so I think having scopes on is better. I have added scope by default. I think most of user will want it. I tried to put cache as your your repo, but nginx gives me error. I don&apos;t know what how your config is working. I tried your repo but it gave me error while installing dependencies. 99773 WARNING pleroma_ynh&apos;s script has encountered an error. Its execution was cancelled. I think there is problem in dependency. I have following dependencies which work. I'm installing a new VM so I can try the install on a new machine. I'll try without esl-erlang as well. If it works without, I may well just drop it completely. Besides that one there aren't dependencies I have that you don't. You do have some that I don't; openssl, g++ and erlang-inets, but I don't think that'll be the problem. I test the repo and nginx don&apos;t give error now if I put the cache-plume.conf to /etc/nginx/conf.d/. But is the media chache working this after the nginx success? What link you have in base_url in prod.secret.exs? Should we have option for enable or disable media cache while installation? Not sure if it should be an option. I think it's not a bad thing to have in general? Can you show your setting of pord.secret.exs with key and database setting removed? @anmol There's a whole bunch of commented lines as well, I removed them here. The quarantined_instances, rewrite_policy and content of reject was added by me manually. Thanks for the config file. That is good. Thanks for your work. @anmol Seems to work without esl-erlang as well. I've updated the package, can you try again? What hardware are you using btw? It's been tested on VM x64, LIME, LIME2 (both x86) and a Debian install on a thinkpad that was converted to ynh but this seems to be a new issue. I am using VM x64 for test. I will try the package. 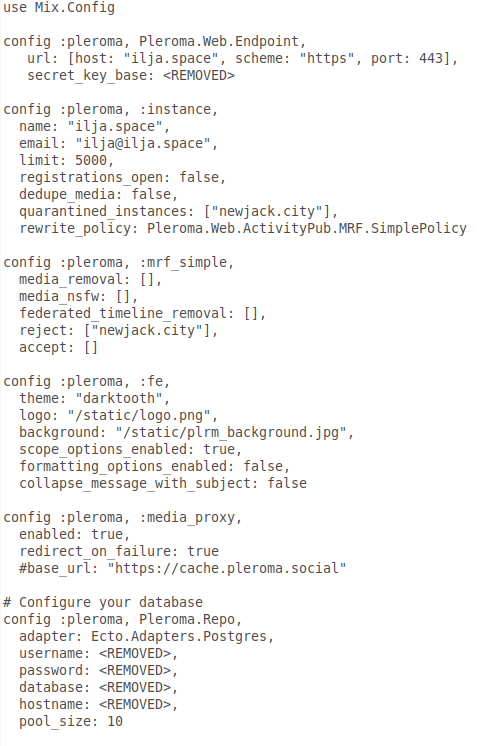 Meanwhile I have upgraded the Pleroma package with cache option while installation.